Exclusive Photos of the heliostat field in operation at the 29 MWth (MegaWatt thermal) Solar-to-Steam EOR (Enhanced Oil Recovery) Project. The project now appears on track to begin operations in the second half of 2011. 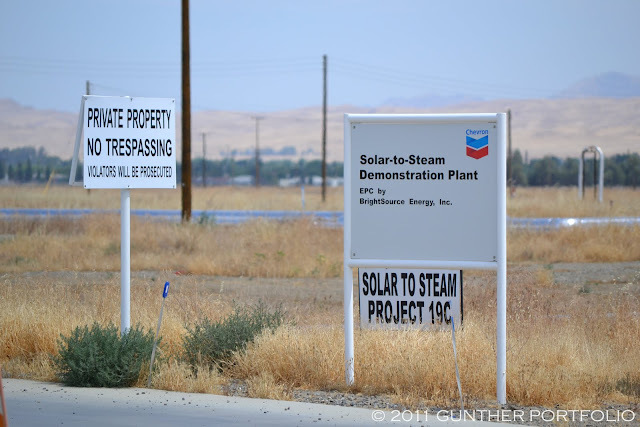 As I crisscrossed the California Central Valley about a week and a half ago, returning to the Chevron Corporation (NYSE:CVX) Solar To Steam Project 19C was a top priority. 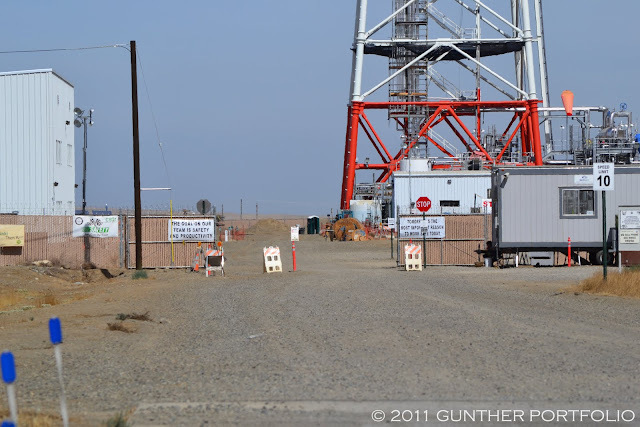 Even via terrestrial roads, the solar tower is immediately visible upon entering the City of Coalinga. Of course, I already knew this since my initial earth based visit was the week before the In Search of the Chevron BrightSource Solar-to-Steam Demonstration Plant flyover when the first attempt was scrubbed. After a navigational snafu, my good luck and timing prevailed. 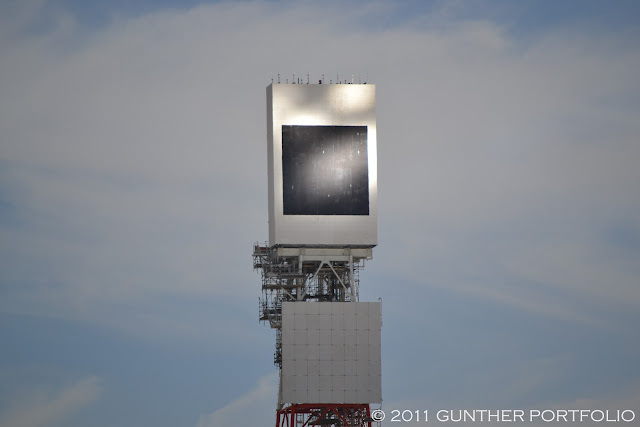 The project’s “more than 7000 mirrors” were directing sunlight onto the solar receiver or boiler. I can only assume steam was being generated since the receiver would need to be cooled when the heliostat or mirror field was in operation. However, I did not observe any visual cues such as steam vapor exhaust or leakage to confirm steam was being produced. I was taking burst mode photos and congratulating my good fortune when the sunlight directed towards the receiver waned. I feared the system was being shutdown. Over the course of two minutes, the black solar receiver went dark and then the sunlight increased to a higher intensity then when I arrived. Looking skyward, I realized some clouds had passed overhead. The Picasa slideshow replays the photo sequence of the cloud incident though not in real time. BrightSource began construction of a solar to steam enhanced oil recovery project for Chevron in Coalinga, Calif. in 2009, installing 3,822 heliostats. That’s the most exact number for the heliostats I have seen, and it’s confirmed by the IVANPAH – A CASE STUDY presentation by Andrew Dyer, Director, BrightSource Energy Australia, at the 7th Australia – New Zealand Climate Change & Business Conference. Since each BrightSource heliostat has two flat glass mirrors, this implies there are in fact 7644 mirrors installed at Coalinga. Now that the satellite imagery at Google Maps has been updated to capture Solar To Steam Project 19C, I’ll leave counting the heliostats to an enterprising reader. 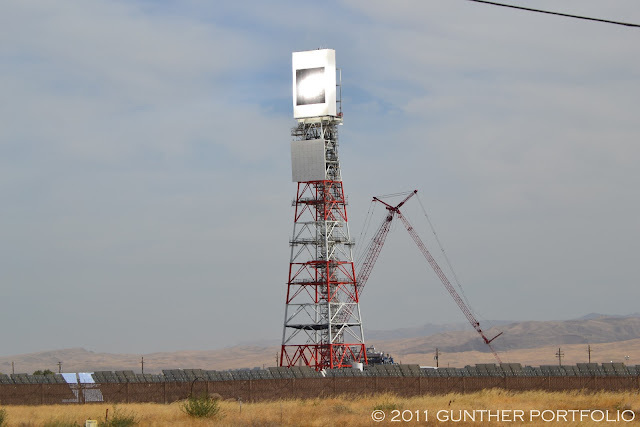 While on the topic of heliostats, I have two further observations from Coalinga. 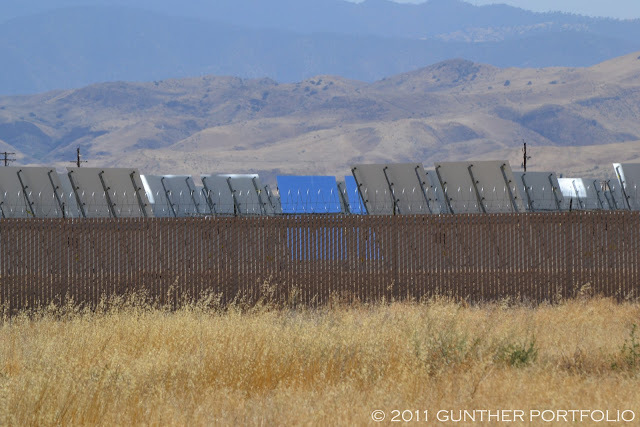 The upper half of the heliostats extend above the privacy fence when tracking the sun, and an errant heliostat or two were not tracking the sun and appear blue, reflecting the sky, in the photos. I wonder if BrightSource’s solar field optimization software and control system can identify heliostat tracking failures? I was in a hurry to publish my aerial photos so I did not get to analyze “BrightSource-Chevron project incurs heavy losses” by Nichola Groom until later. 1 MW (electrical power) [MWe] = approx MWth (thermal) / 3 or in other words it takes 3 MWth to make 1 MWe. I think my original calculation used the heliostat numbers available, but the 3 MWth (thermal power) to 1 MWe (electrical power) conversion approximation is crucial. BrightSource Energy’s Ivanpah Solar Electric Generating System (ISEGS) project is 392 MWe gross or 1176 MWth which implies Ivanpah is almost 40.6 times larger than the Chevron Coalinga solar tower on a thermal power basis. These items included non-recoverable customer driven design changes, increased vendor and material costs due to scope and design changes, increased mechanical and electrical costs associated with design and engineering changes, delays and subsequent costs to remobilize and accelerate construction as the result of abnormal weather patterns, and increased costs associated with efforts to accelerate the scheduled completion of the facility. Subsequent to March 31, 2011, we have continued to experience substantial increases in our estimated cost to complete and related contract loss due to additional estimated costs primarily associated with design specification errors provided by one of our third-party design engineering subcontractors. As we neared the final stages of the construction process, we identified design issues that led to our replacing this design engineering subcontractor. 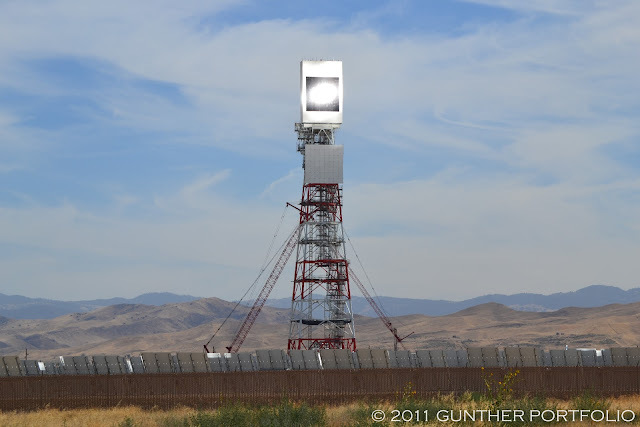 A subsequent detailed review resulted in modification of certain engineering designs associated with the solar tower systems. This change resulted in significant delay and substantial rework. This also resulted in our other construction and electrical subcontractors incurring substantial cost which we do not anticipate being able to recover. Therefore, until final completion of the project, our estimated costs to complete may increase and we accordingly may incur additional provisions for losses related to the increased anticipated cumulative loss since inception of the contract. We do not intend to act as EPC contractor on Ivanpah or future projects as construction and construction management are not our core competencies. 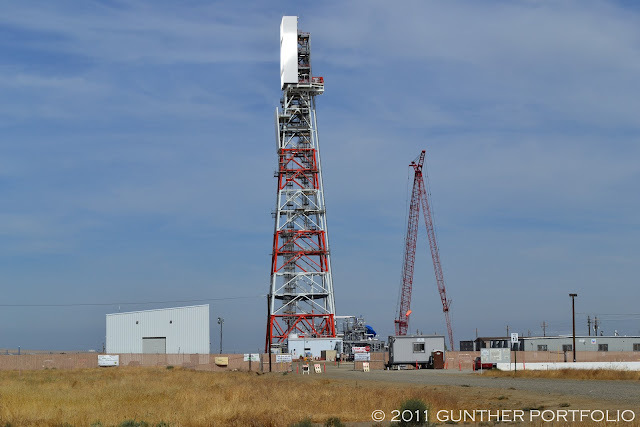 The good news for BrightSource is the Chevron Coalinga solar tower has begun trial operations and should be on a path to final customer acceptance in 2011. 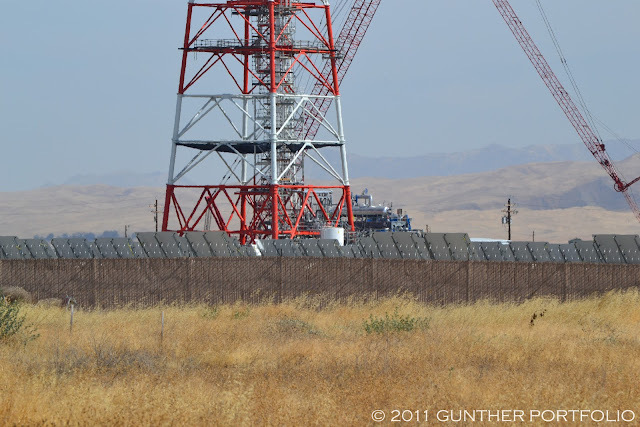 I asked Chevron Technology Ventures about the status of the Coalinga solar tower and whether trials were underway or the system is being ramped into normal EOR operations. On short cycle, I have not gotten a response yet from the $187 Billion market capitalization company regarding the project costing them $27.7 Million out of pocket. Although I consider my photos exclusive, I did see another person with a point and shoot camera rather close to the privacy fence as I was leaving the site. 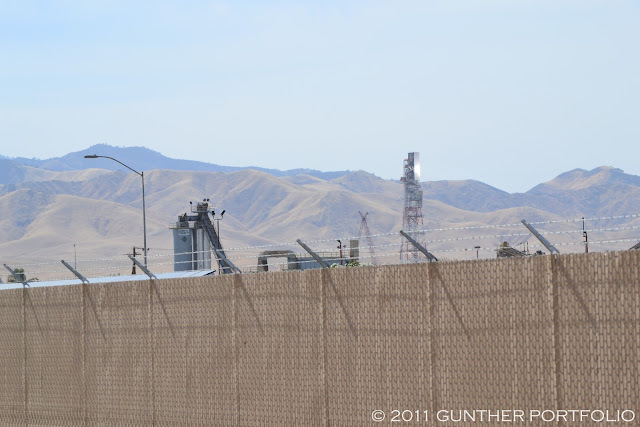 By the way, the sunlit solar tower is also visible from the Granite Construction Inc. (NYSE:GVA) Coalinga Aggregate & Hot Mix Facility. Customer acceptance? If my capital construction project overran by 200% my boss would drop me into Waziristan by a parachute to fend for myself. How do you get paid from these guys? I performed some contract work and that invoice finalized in May. more heat generated at the focal point. From the looks of things, the Brightstar approach to CSP as an EOR is not economically viable. Is this the current thinking in the community at this time?